Dubbed the "Sport of Kings," the foil is a descendant of the light, court sword formerly used by nobility to train for duels. It has a flexible, rectangular blade approximately 35 inches in length and weighing less than one pound. Points are scored with the tip of the blade and must land on valid target: torso, from shoulders to groin in the front, and shoulders to the waist in the back. Foil employs rules of right of way. The fencer who starts to attack first is given priority should his opponent counter-attack. An electrical scoring system detects hits on valid target. Each foil has a blunt, spring-loaded button at the point of the blade that must be depressed with a pressure of 500 grams or more to register a hit. The foil fencer's uniform features an electrically wired metallic vest called a lamé - a hit to the lamé causes the scoring machine to display a colored light on the side of the fencer that scored the touch. The epee (pronounced EPP-pay - literally meaning "sword" in French) is the descendant of the dueling sword. It is heavier than the foil, weighing approximately 27 ounces, with a stiffer, thicker blade and a larger guard. As in foil, touches are scored only with the point of the blade; however, in epee the entire body, head-to-toe, is valid target - much like in an actual duel. There is no concept of "off-target" in epee. Some people refer to epee as "Freestyle Fencing" because anything goes. The saber is the modern version of the slashing cavalry sword. As such, the major difference between saber and the other two weapons is that saberists can score with the edge of their blade as well as their point. In saber, the target area is the entire body above the waist, excluding the hands. In addition, saber has rules of right of way which are very similar to foil but with subtle differences. At Presidio Fencing Club, we consider the Epee and Saber to be advanced weapons. Seniors (i.e. those aged 13+), may choose to practice with these weapons during sparring sessions. The above information is provided with thanks from US Fencing. Visit their website for more information. 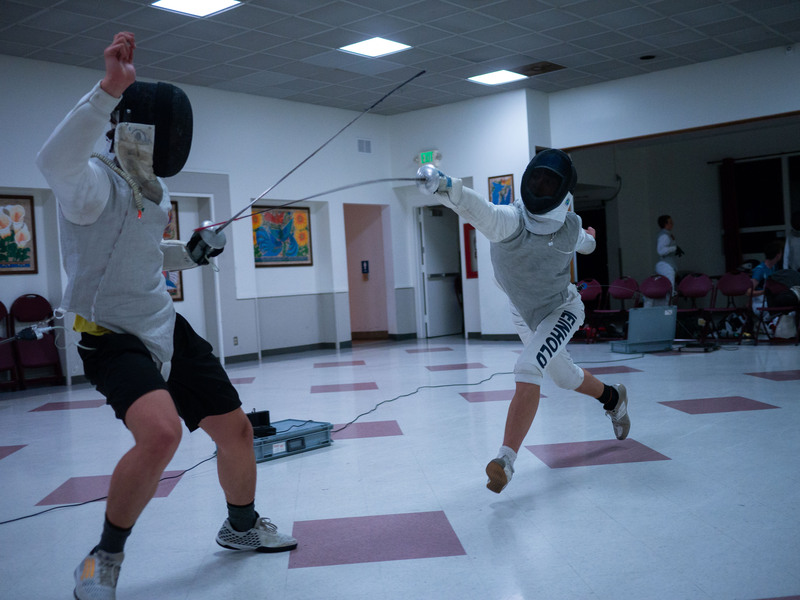 Presidio Fencing Club comprises a group of fencing enthusiasts from Santa Ynez and Lompoc all the way down to Carpinteria. Through weekly practices, we provide opportunities for training in Olympic sport fencing to novice and experienced athletes, aged 10 to Adult. Presidio Fencing Club is a member of the Southern California Division of the United States Fencing Association. We operate under the umbrella of the Central Coast Fencing Foundation, a 501(c)(3) non-profit organization (tax ID# 820540198). The club began in 2004 as a recreational outfit called Santa Barbara Youth Fencers. In 2006 we changed our namesake to identify ourselves as an outpost for sport fencing in the Santa Barbara area. 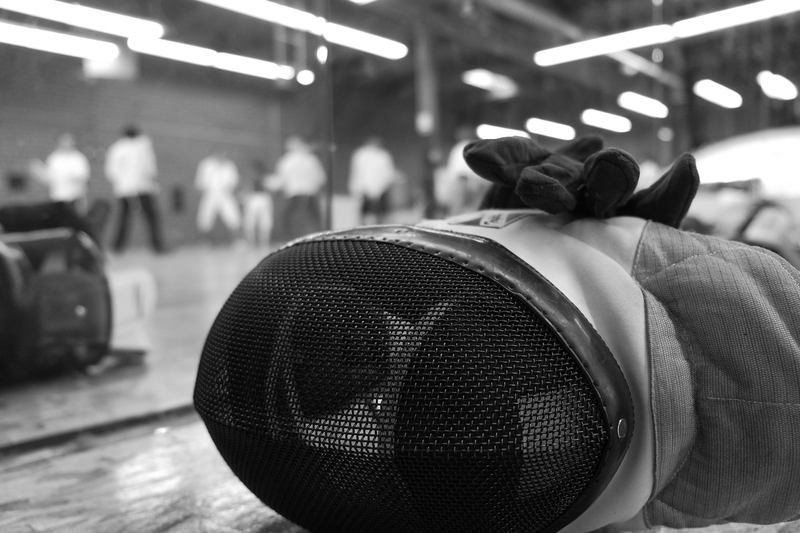 In 2011, we began Presidio North, a venue for fencing classes in Northern Santa Barbara County. Most Presidio fencers are recreational athletes, coming to practices to break a sweat. A few others travel to Los Angeles, the Bay Area, and elsewhere in the country for competition. Click for a brief description of the sport. For insurance purposes, membership with the United States Fencing Association is required before joining any class. Membership is $10, and expires on July 31. It may be purchased by visiting USFencing.org. Find us on Facebook for current news and announcements. We train as a team, with practices organized into Drills and Sparring. A typical practice starts with a group warm-up, along with some footwork drills to improve strength, agility, and power, as well as a foundation for tactics. We then set up our electrical strips for situational sparring. We also address topics such as nutrition, goal setting, tournament mentality, and equipment maintenance. Note that all fencers must have their own electric gear to participate in all sparring sessions and competitions. Tim Robinson coaches at Presidio Fencing Club and at UCSB, where he has held a lecturer position in Exercise and Sports Studies since 2002. He holds the rank of Prevot d'Armes with the US Fencing Coaches Association (USFCA) and the International Academy of Arms (IIA). Coach Robinson was named USFCA Coach of the Year in 2017, based on his work with the UCSB Fencing Team. 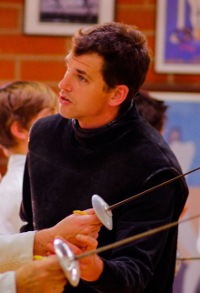 His focus on the functional and athletic development of young fencers also earned him a Coach of the Year award from SBParent.com in 2008. Tim's students have reached medal rounds in various local and national tournaments since 2006. Presidio North brings swordplay to Northern Santa Barbara and the Santa Ynez Valley with open practices at the Dunn School. The first hour of each practice is generally a drill class, taught in a group format and aimed primarily at beginning-level fencers. The second hour focuses more on sparring. Dunn School Foil Team. 2016 Central Coast High School Fencing Champions. Presidio North is fortunate to have dedicated volunteers with considerable fencing experience. Walter Goodwater, for example, coaches the Dunn School Fencing Team and leads the practices at Presidio North. 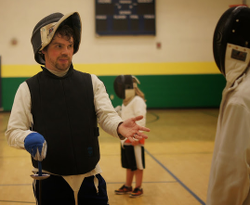 Coach Goodwater is a competitive fencer, an experienced referee, and the organizer of many fencing tournaments on the Central Coast. He is also a former chair of the Central Coast Fencing Foundation, a non-profit organization dedicated to improving the sport of fencing in our area. Another experienced regular at Los Olivos practices is Kevin Sparkman. A former collegiate fencer, Kevin was on the UCSB Men's Foil team when the Gauchos won their intercollegiate conference three years in a row. You may be able to join our drill classes if you are born in 2008 or earlier. Use the Google form to inquire about availability and register for introductory classes. The best time to start a new class is at the beginning of the quarter (October, January, and April). Fencing is a difficult sport to experience in just a single class or two. New students should plan on spending their first few classes just learning the basic footwork. To continue beyond that, students will need to sign up and take introductory lessons with a coach. When they want to start sparring, they will need to purchase their own gear. See our equipment page for a list of what to buy. To offset the cost of purchasing gear, we waive the first quarter of membership dues. Step 1: Add your name to our waiting list by completing the Google Form. Step 2: Watch the preparatory and footwork videos linked in our References section. Video Group #1 is a little dated, but the actions are sound. Video Group #2 is an innovative approach to fencing movements taught by Olympian Dave Littell. He provides a whole series of valuable videos that start with a functional understanding of the sport. Step 3: purchase a non-competitive membership from the United States Fencing Association. This $10 membership provides insurance, and is collected by US Fencing. Step 4: Arrange for some introductory lessons. Although brief, they can be intense. And they will impart the basics needed for participation in the drill sessons. Wear comfortable clothes, athletic shoes, and bring a water bottle. You might also want to bring a spare t-shirt. Your first few practices will only involve practicing footwork, and will likely only last until 7 pm or so. Introductory lessons are $20/each, and we provide the necessary equipment for working one-on-one with a coach. We recommend at least five introductory lessons. Step 5: When you're ready for group drills and to try some sparring, purchase your equipment. Find a list of what to buy on our equipment page. A complete set of brand new gear will cost ~$310 (mask, jacket, glove, underarm protector, electric foil, body cord, and electrical jacket). Presidio Fencing Club is not an equipment vendor; however, we do try to connect new and old fencers to sell second-hand gear. Also, we waive the membership dues during your first quarter to help off-set the initial cost of buying equipment. Step 6: Welcome to the club, and the awesome sport of fencing! For full practices in Santa Barbara, including workouts, sparring, and instruction in foil and epee and sometimes saber. Also includes intermediate and advanced lessons, as the coach's schedule allows. Subsequent family member discounts are available. Practice for non-members. This rate is for people who want to come and fence on occasion, but who do not want instruction. One-on-one instruction is not an option for infrequent visitors. Pre-payment for a 5-visit punch-card provides discount. Punch-cards expire at the end of each quarter. One-on-one lessons to practice drills on a willing target and learn new skills. Due to scheduling, only a limited number of lesson are available for purchase and priority is given to new students. Group practices in Los Olivos at the Dunn School. Practices are free to Dunn School Boarding Students. One-on-one lessons in Los Olivos at the Dunn School. All membership dues go directly to the operations of Presidio Fencing Club (rent, insurance, equipment, etc). Tax deductible donations can also be made to the Central Coast Fencing Foundation. To make a donation, or for more information about the Foundation, visit http://centralcoastfencing.org. Classes must be paid for in advance via cash, check, or charge (via PayPal). There are no refunds. All sales are final. Please contact us directly if you have questions. Note that PayPal charges made via this website will incur a small processing fee. Each lesson is approximately 20 minutes in length. Some lessons might end earlier, at the coach's discretion, and for various reasons (i.e. student fatigue or lack of focus). Some lessons might last longer. Lessons should be purchased in advance as a punch card/package, with a 5-lesson commitment, and must be taken during the quarter they are purchased. For larger competitions involving travel (i.e. some qualifiers, RYC, SYC, ROC, and NAC), all participating athletes will share in their coach's travel expenses and Per Diem. Services such as fixing body cords or rewiring weapons, may require additional fees. 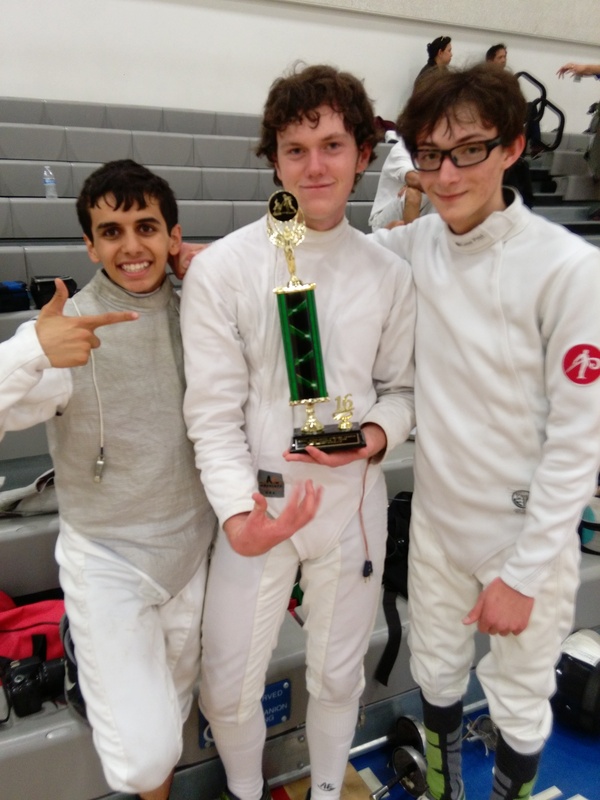 Presidio's Dos Pueblos High Men's Foil team. 2016 SoCal Scholastic Champions, Varsity B Division. Los Angeles, CA. Photo courtesy Richard Block. 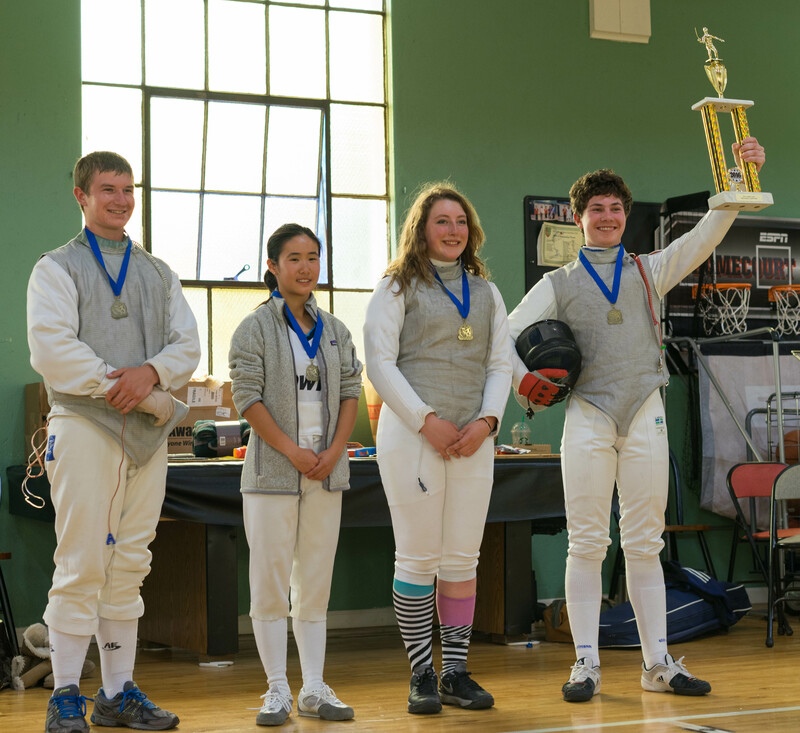 There are a number of different fencing leagues, including those for youth, those for inter-scholastic competition, and those leading up to the Olympic Games. Each league or conference tends to have its own championship event. Rather than try to keep track of all of the events, we have prepared a list of links to various league calendars. All fencers must purchase their own equipment to participate in our practices. Presidio is not an equipment vendor, but we provide a list of trusted vendors and guidelines on what to buy. We also try to connect people to buy and sell second-hand gear. Are you looking for another jacket or mask? Have you or your child outgrown a jacket or mask? Let us know. With thanks to Kevin Osborn, Doug Golupski, and the Brooks Institute for the header photos.